Larry Slaugher, 6’8″, 225 has a D-1 body. He runs the floor well and never misses a practice. 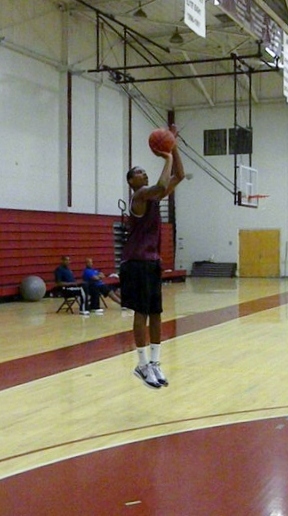 He started for AVC in his freshman year and was doing well. He experienced an injury and his replacement took over and Larry played a backup role for the remainder of the season. Larry seemed to lose his confidence and was not as agressive as he was early in the season. Larry ended the season with 3.8 ppg and 3.0 rpg. This is a key year for Slaughter. He is going to have to get stronger in the weight room, become more agressive in the middle, and dominate defensively. Agression is the word. There is no question that Larry has the phyical ability to play at the D-1 level. It is up to him to be the beast that he is capable of.